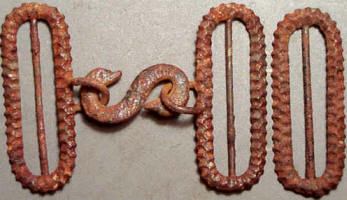 Two part buckle, "snake" or serpent head with a beak, tall pattern. These imported plates, referred to as "snake" buckles, actually depict a mythical serpent, this plate bears a head with a beak. Plate is believed to have been manufactured in England and imported, presumably Confederate use but either side could have had them. This tall pattern would accommodate a two inch belt. Measurements of the rounded keepers will vary considerably. Ref: Mullinax Expanded Edition, Plate 199. P0358...Confederate buckles and plates, stamped rounded corner CS platesTwo part buckle, "snake" or serpent head with a beak, tall pattern. These imported plates, referred to as "snake" buckles, actually depict a mythical serpent, this plate bears a head with a beak. Plate is believed to have been manufactured in England and imported, presumably Confederate use but either side could have had them. This tall pattern would accommodate a two inch belt. Keepers measure 61mm, approx. Recovered: tongue was found Third Battle of Winchester, by Harry Ridgeway in 1962, the keeper is correct fit and was also found in the 1960's, but found somewhere else. P1334...Confederate buckles and plates, stamped rounded corner CS platesTwo part buckle, "snake" or serpent head with a beak, tall pattern. 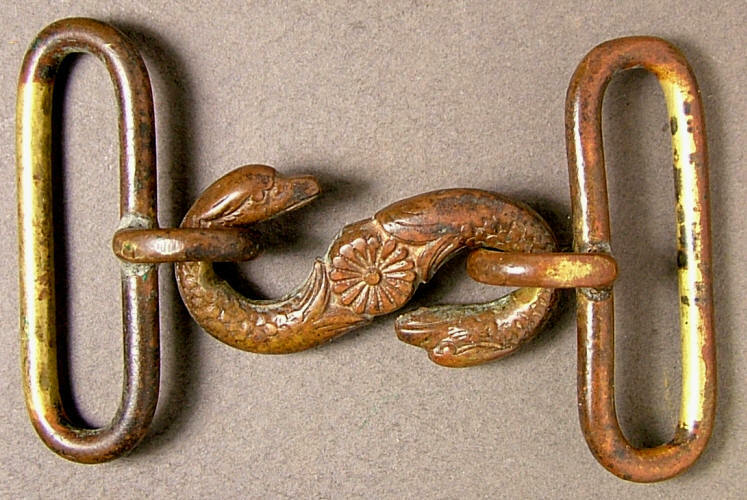 These imported plates, referred to as "snake" buckles, actually depict a mythical serpent, this plate bears a head with a beak. Plate is believed to have been manufactured in England and imported, presumably Confederate use but either side could have had them. This tall pattern would accommodate a two inch belt. Keepers measure 68mm, approx. Nondug plate. These imported plates, referred to as "snake" buckles, actually depict a mythical serpent, this plate bears a head with a beak. Plate is believed to have been manufactured in England and imported, presumably Confederate use but either side could have had them. This short pattern bears an artistic medallion. Measurements of the rounded keepers will vary considerably. Ref: Mullinax Expanded Edition, Plate 198. 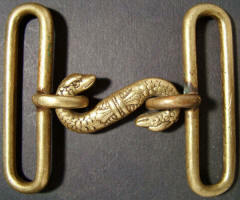 P1476...Two part buckle, "snake" or serpent head with a beak and a medallian, short pattern. These imported plates, referred to as "snake" buckles, actually depict a mythical serpent, this plate bears a head with a beak. Plate is believed to have been manufactured in England and imported, presumably Confederate use but either side could have had them. This short pattern bears an artistic medallion. Keepers measure 47mm. Nondug plate. 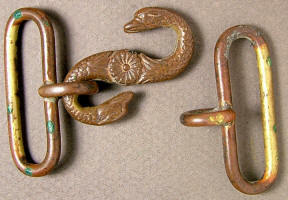 Two part buckle, "snake" or serpent head with a beak, ornate keeper with a center bar, tall pattern, iron buckle. 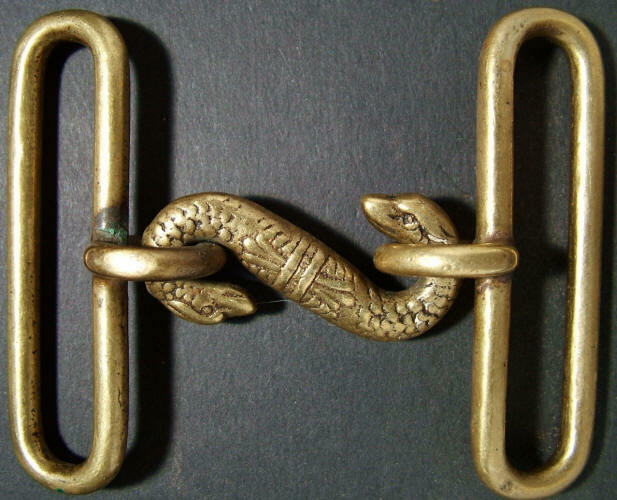 These imported plates, referred to as "snake" buckles, actually depict a mythical serpent, this plate bears a head with a beak. Plate is believed to have been manufactured in England and imported, presumably Confederate use but either side could have had them. This long pattern is very light and made from iron, with fancy keepers and a center bar, third matching keeper is a belt adjuster. 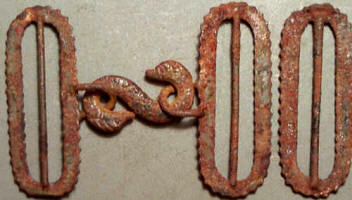 This is a very large buckle, it may or may not be military, and dating is not determined. Measurements of the rounded keepers will vary considerably. Ref: Mullinax Expanded Edition, not listed. P0812...Two part buckle, "snake" or serpent head with a beak, ornate keeper with a center bar, tall pattern, iron buckle. 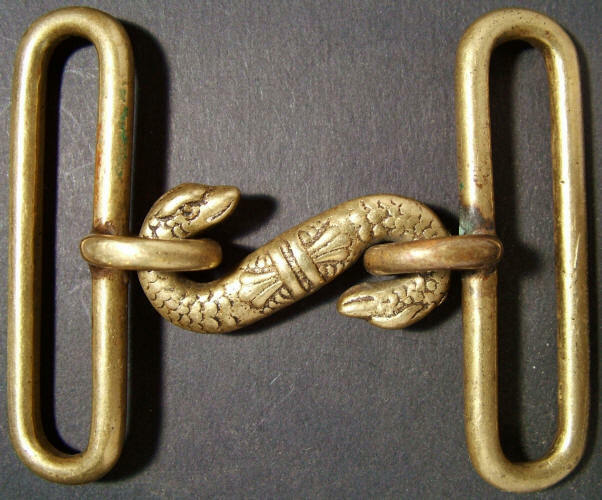 These imported plates, referred to as "snake" buckles, actually depict a mythical serpent, this plate bears a head with a beak. Plate is believed to have been manufactured in England and imported, presumably Confederate use but either side could have had them. This long pattern is very light and made from iron, with fancy keepers and a center bar, third matching keeper is a belt adjuster. 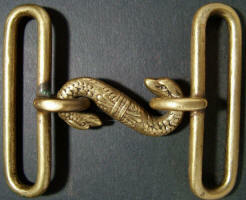 This is a very large buckle, it may or may not be military, and dating is not determined. Measurements of the rounded keepers will vary considerably. Dug buckle, iron, all three pieces found together. Recovered: Virginia location not specified.